Lorraine Ross and Jim Ross run through a rehearsal for the Lennox Community Theatre's upcoming production of Love Letters, which debuts Sept. 14. Photo by Adam Prudhomme. Curtains will rise on another season at Selby’s Lennox Community Theatre on Sept. 14 with a production of A.R. Gurney’s Love Letters. 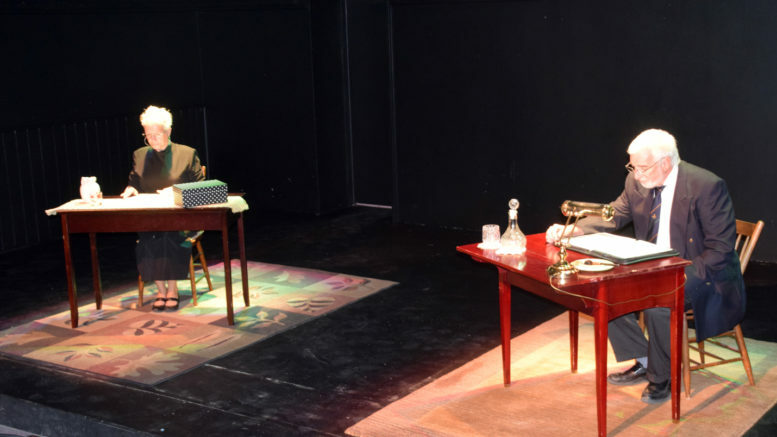 Directed by Lorraine Ross, the play features two lifelong friends-Andy and Melissa, who write letters back-and-forth from the time they’re eight right through until they enter their 50s. The play was written in 1988, nearly a decade before e-mail began to kill off the written letter. Since it debuted at the New York Public Library it has been produced across North America, drawing the likes of Charlton Heston and his wife Lydia Clarke, Robert Wagner and Jill St. John and Tom Hanks and Rita Wilson in starring roles. Though it may be a bit dated, Ross says the play will resonate with today’s audience. The play features a bit of a ‘will they or won’t they’ element, as told by the two characters through letters they exchange throughout childhood and into adulthood. The characters of Andy and Melissa are the only two that appear on stage but in an effort to encourage more actors to get involved with the Lennox Community Theatre, Ross took an unorthodox approach and cast 10 people. That’s five Melissas and five Andys. Each pair of actors and actresses will get two turns on stage during the show’s 10 day run. Along with Ross, the cast also includes Jim Ross as well as pairs featuring Shari Maracle and Scott Roodvoets, Sarah Kiry and Mike Kirby, Jo-Anne Smith and Wihse Green as well as Amy Mack and Patrick Mueller. The show will run Sept. 14, 15, 20, 21, 22, 27, 28 and 29 at 8 p.m. and feature 2 p.m. matinees on Sept. 16 and 23. New for this year, the Lennox Community Theatre will feature online tickets, which are available at www.LennoxTheatre.ca/tickets. Tickets will also be available at the door the night of the events. This means tickets will no longer be sold at Gray’s IDA in Napanee, though they will still sell gift certificates. Tickets are $18 or $12 for children under 12. Senior pricing of $15 is available during the Sunday matinees. Coming later this season to the Lennox Community Theatre will be Miracle On South Division Street (Nov. 23), I Ought To Be In Pictures (Feb. 1), Babe Ruth Comes To Pickle River (March 29) and Belongings (May 31). The theatre is located at 2219 County Rd 11 in Selby.